Self-publishing is when an author decides to publish his or her own work without the assistance and resources of a commercial publishing or vanity/subsidy publishing company. The author assumes all the risks and rewards, be they financial or otherwise, of his/her efforts and success (or lack thereof). It is a rapidly growing segment of the publishing industry. Something Or Other Publishing (SOOP) was founded by an author who discovered that the effort involved in self-publishing, and the education he received, required him to apply a wide range of entrepreneurial, business, technology, and creative skills. He realized that the model he developed to succeed could help others to learn and benefit from what he learned. As a result, the SOOP model emphasizes author education, encouragement, and empowerment and a focus that extends well beyond the words on the page. SOOP aligns a talented team and company resources around helping the author succeed on the author’s own terms. 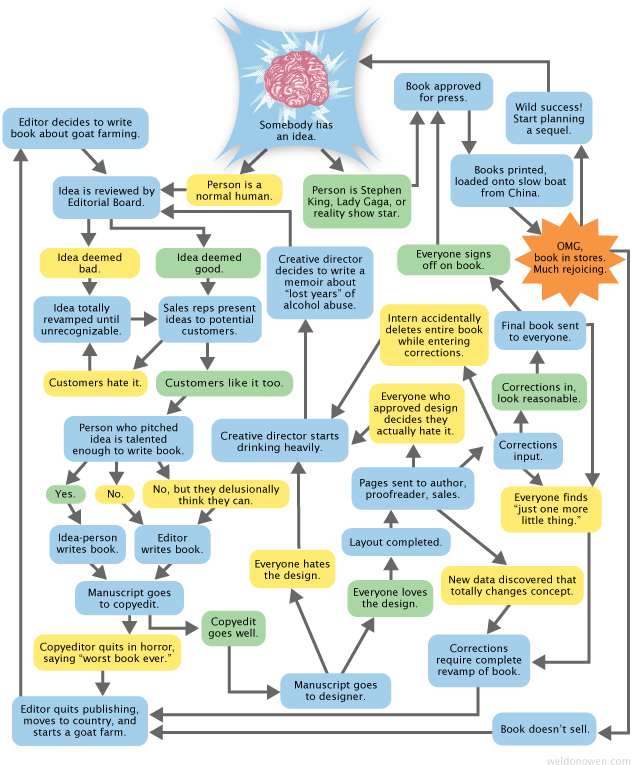 We call it Author-Driven Publishing. In our model, the author ultimately decides whether his/her success will be defined by self-publishing, a publishing contract with SOOP (via our democratized selection model), or even publication elsewhere. In any case, the author can enlist the breadth and depth of SOOP resources to increase the chances of a successful book launch. Whatever your situation, we encourage you to take the time to research your options. Wikipedia provides a great overview of Publishing, and Andrew Doty’s three-part blog about self-publishing, traditional publishing, and the new middle ground (1 2 3) is another great resource. Once you feel like you have a good overview of your options, you can check out our Services Marketplace. There, you can locate one of our recommended providers to help you with whatever challenge you are currently facing on your path to publication: editing, proofreading, book design, marketing, etc. If you’d like to learn more about our company, you can read about us, our submission guidelines, and all the ways we help authors publish. You can also check out our blog and the current book ideas working toward publication with SOOP. And if you need further assistance, at any point, don’t hesitate to contact us for guidance. Your success is our goal.